1 Year Later, What Have We Learned From Lumber Liquidators? A little more than 12 months ago, support for Lumber Liquidators' stock, well, liquidated. We look at three lessons that can be drawn from the retailer's harrowing year. It's been a little more than a year since Lumber Liquidators' (NYSE:LL) troubles with laminate flooring sourced from China sparked a dramatic tumble in the company's stock. First-quarter 2016 earnings released this week reveal a company still grappling with the effects of a public relations debacle, though it has not sold the flooring, which is alleged to have contained the carcinogen formaldehyde, since May 2015. What have we learned during the last 12 months? A complete list would exceed my ability and your patience, so let's focus on three of the most relevant lessons we can take away from Lumber Liquidators' extended plight. Back in July 2013, during a conference call with analysts, former Lumber Liquidators CEO Robert Lynch crowed about the company's gross margin improvement of 400 basis points, or four percentage points, during the second quarter of 2013. The analysts seemed mystified. Selling discount flooring is a cutthroat business, and margins are inherently low to begin with. 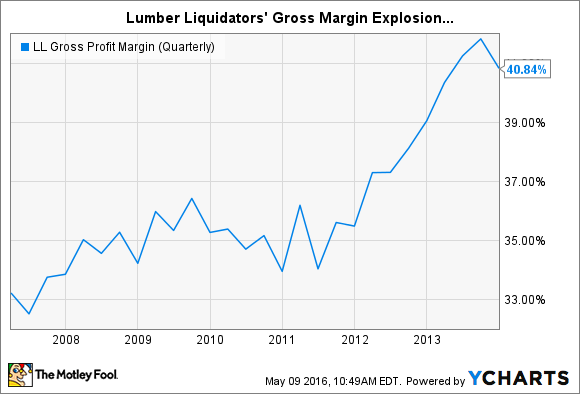 Lumber Liquidators had worked hard to hold its gross margin in the mid-30% range for several years, and now, if not defying gravity, those profits were certainly daring it. One analyst asked for executives to reconcile the margin leap with the fact that raw hardwood costs were soaring under the impact of double-digit inflation. Was it perhaps some advantage the company held in sourcing? It's easy in retrospect to understand the analysts' admiration, tinged with incredulity. It turns out that such an enormous leverage in margin came at a price. After a 60 Minutes segment in early 2015 revealed the allegations of carcinogen contamination, the company's sales plummeted, flattening gross margin to the low 20% range. On a positive note, gross margin is starting to recover, reaching 32.6% in the current quarter, not far from historical norms. The lesson here is that the promise of easy and ultra-fast profit expansion in a margin-poor industry can be a Mephistophelian bargain. The profit euphoria can result in a false sense of well-being, when in many cases, management should be doubling down on due diligence procedures. After founder Thomas Sullivan stepped in temporarily to run the company following the departure of Robert Lynch last year, Lumber Liquidators named John Presley, a member of its board of directors, as its new CEO. The company's press release at the time cited Presley's "operational expertise and track record of successful turnarounds" as two of many reasons for his appointment. But Presley, who had served on Lumber Liquidators' board since 2006, was also an attractive candidate due to his status as...a career banker. What does the staid business of banking have to do with hustling cheap flooring and accessories to the masses? Not much, until you consider that success within a highly regulated industry like banking can be immensely helpful to a company suffering from a lack of adequate compliance muscle. Presley has his hands in his new position. This quarter, Lumber Liquidators announced a memorandum of agreement with the lead plaintiffs in a consolidated securities class action suit, as a prelude to settling outstanding claims, for which it took a charge of $16 million. Bringing in an operations guru to slash costs to reward shareholders in the short term is an option many companies in this position consider, but Lumber Liquidators wisely passed up such a path. Instead, they hired a CEO who is currently bent on putting compliance issues -- and thus issues of customer and investor trust -- behind the company. A financial turnaround is almost secondary until this task is completed. As for that financial turnaround, it can be described as nascent at best. Sales still haven't recovered, declining 10.2% in Q2 2016, dragged down by a comparable-sales decrease of nearly 14%. A net loss of $32.4 million can be blamed on the decreased revenue, as well as higher settlement and legal costs, which reached $29.5 million during the quarter. Yet the company's balance sheet is in surprisingly decent shape, given that it's been tossed about in an earnings maelstrom for four consecutive quarters. Current assets exceed current liabilities by a ratio of 2:1, and the company is obligated for only $25 million in long-term debt, against a net stockholders' equity base of $246 million. This relative health is due, as I wrote in an analysis last fall, to a focus on trimming inventory levels, dispensing with unprofitable lines, and getting back to selling flooring SKUs where the company can respond to customer demand while making a reasonable profit. The organization could have easily spent the last year in denial, allowing inventory to bloat while management hoped for customers to return and swiftly restore the status quo. By not waiting around for this best-case scenario, Lumber Liquidators preserved its balance sheet. Acting on founder and interim president Thomas Sullivan's business instincts, the company decided to keep moving product, especially obsolete and unpopular lines, even if it meant sacrificing margin. This allowed Lumber Liquidators to cycle its inventory -- its biggest source of liquidity -- at a faster speed, and at essentially a cash break-even point, over the last few quarters. Days inventory outstanding, a measure of how quickly inventory turns over, has decreased from a pre-crisis 168 days to 141 days as of this latest quarterly report. In this final lesson, there's perhaps room for guarded optimism. Resources on hand imply that while the near future still seems problematic, as the company shoots for a turnaround, it at least has the wherewithal to stick around.